Davit Arms and Industrial Abseiling Anchors for Suspended Access? Providing adequate edge protection as a collective measure can often be a challenge, with many roof spaces now being home to generators, HVAC, and other mounted applications. With the installation of a Davit Arm or Abseiling Anchor at roof level, rope access technicians can safely abseil down your high-rise building to maintain and repair windows and façades. 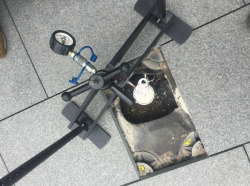 As a non-intrusive solution for suspended access, Heightsafe’s Davit Arms and Abseiling Anchors will guarantee full coverage to your external fabric and ensure that your building’s structure is safe from potential damage. Heightsafe’s innovative Davit Arm systems are market leaders in the Work at Height arena, providing clients with a lightweight, portable, and cost-effective solution for suspended rope access requirements – which can for example, fulfil façade access as part of a building’s maintenance strategy. Working load limit conforms to IRATA and all other associated abseiling standards. 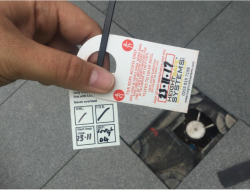 Heightsafe’s Fall Arrest Abseiling Anchors, commonly known as ‘Mushroom Posts’ are designed to be fixable to various surfaces and materials, and with the ability to use the system both internally and externally, maintaining difficult to access indoor spaces just got easier! Heightsafe’s team were tasked with providing a safe solution for the maintenance of a premium building in Mayfair that comprises of 10,322 square metres of office, retail and residential space, 6 luxury flats, and 3 underground basements. The location of the property is in a prestigious and historical area of London, and therefore required a visually sensitive system that would not take away from the local heritage. Following serious consideration and advice from Heightsafe’s specialists, the client opted for the installation of 22 Davit Arms – allowing for skilled Rope Access technicians to complete maintenance requirements safely. As these systems are portable they can be removed out of site when not in use, ensuring the historical aesthetics of the location is not affected. Did you know? 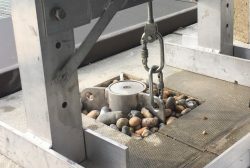 Due to the load capacity that suspended access systems support, it is a legal requirement to have them tested for compliance twice annually, and 6 monthly for rope access. Clients benefit from over 50 years of combined experience in the Work at Height industry when they choose Heightsafe. Wherever you are in the UK, our specialist team are happy to help with your high-level requirements. For more information, get in touch to speak to our Davit Arm specialists today! Looking for rope access fabric maintenance services? Heightsafe’s Rope Access teams are highly qualified and provide the highest levels of competency when abseiling down any type of building; from football stadiums to residential blocks and hotels for both cleaning and repairs.